← How to link PDF file for my website? Question: I have a PDF file that was created from PowerPoint slides. The PDF file has 3 slides per page. How do you make the PDF file have 2 slides per page instead? By the way I don't have the original ppt slides. Is there a solution on VeryPDF? Answer: According to your description, there is no better method on VeryPDF, but you can try to separate PDF file has 3 slides per page into one slide per page by VeryPDF Advanced PDF Page Cut. And then merge them one PDF file by PDF Split and Merge. Last, you can stitch PDF to two slides per page by VeryPDF PDF Stitcher. It sounds complicated but it is really one method to figure this method out. Both of those software are GUI version, so they are extremely easy to use. All the process could be finished in a few seconds. Please check more information of this software on homepage, in the following part, I will show you how to use this software. Step 1. Separate PDF from 3 slides per page to one slide per page. 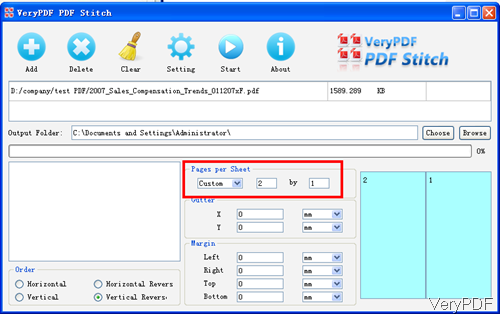 Download Advanced PDF Page Cut and install it by double clicking the exe file and following installation message. When installation finishes, there will be short cut icon showing off on desktop. Simply click it then you can launch this software. 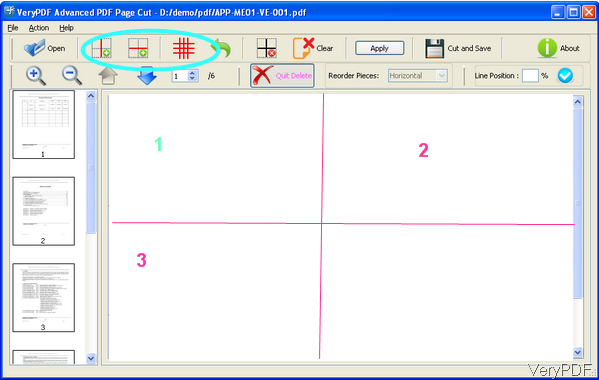 Please click button Open to add PDF file to software interface, please click button Line icon both vertical and horizontal to draw lines to separate PDF into four parts. As there are three slides here, please click Delete Pieces button to delete two of them and then click button Apply to apply setting to all pages of this PDF file. The click button Cut and Save, then you can one of the slide as a new PDF file. Just repeat those steps then you can separate PDF with three slides to one slide per page PDF. Step 2. Merge separated PDF files into one. Download PDF Split-Merge to merge all the single page PDF file one one PDF file. By the same method to install this software. The following snapshots is from the software interface, please have a check. Please go to tab of Merge PDF files, you will see menu like the following snapshot. Please click button Add to add all PDF file to this software interface. Click button Browser to choose output folder and then click button Run the start the merging process. By this method, we can merge all single page PDF to one PDF file. Step 3. Stitch PDF to two slides per page PDF. Download PDF Stitcher and install it like other GUI version software. The following snapshot is from the software interface, please have a check. Please note this software only can be used to merge pages from one PDF file to N part per page PDF file, so that why I merge PDF into one by the step 2. Please add PDF file to software interface , choose output folder. In the Pages per sheet part, please custom to 2x1 or 1x2. By this method, you can make two slides per page. As to order, you can choose vertical or horizontal according to your needs. Click button Start to run the conversion process. By those three software, we can separate PDF file has 3 slides per page to two slides per page. During the using, if you have any question, please contact us as soon as possible. How to convert html to pdf format? This entry was posted in PDF Page Cut and tagged separate PDF. Bookmark the permalink.